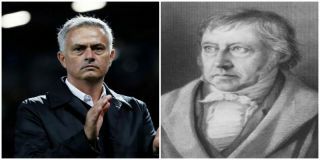 Jose Mourinho referred to the writing of renowned philosopher Georg Wilhelm Friedrich Hegel when discussing his position at Manchester United today. The Portuguese boss has never been too far away from the headlines but as of late, it seems as though he cannot keep himself out of the spotlight – for all the wrong reasons. His United team is already six points behind the frontrunners in the Premier League after suffering back to back defeats against Brighton and Tottenham, with many supporters and experts questioning whether he is up to the task at the club. His defensive style of play has been called into question many times during his tenure at Old Trafford, given the fact that the club has built a sterling reputation over the last few decades associated with entertaining attacking football. Mourinho is content with winning at all costs but he hasn’t even been able to do that recently and after Monday night’s 3-0 defeat at home to Spurs, it appears that his time in Manchester may soon be drawing to a close. After that game he was in a defensive mood when talking to reporters, citing his previous success as a manager before storming out of the press conference and he has reportedly been in a similarly spiky mood on Friday afternoon in front of the media. According to The Guardian, the 55-year-old coach quoted the famous philosopher Hegel to back up his claims as being one of the ‘greatest managers in the world’ in a bizarre outburst, as he questioned a reporter: “Did you read any philosopher or in your formation you never spent time reading, for example, Hegel? The Red Devils face a must-win game at Turf Moor against Burnley on Sunday, which is surely last chance saloon for Mourinho amid widespread criticism of his methods and reports of his imminent sacking – as per The Express. If United can pick up three points against Sean Dyche’s side, who have also had a poor start to the season, then the gloom surrounding the club should be lifted for at least a short while, but it remains unclear whether or not Mourinho can turn the situation around in time to save his job.